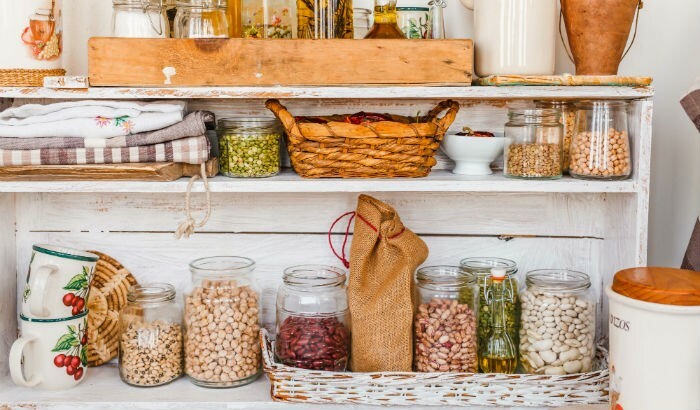 Organising your pantry should start with clearing up your space. Sort through your supplies and discard those that have expired. This step will help you decide how to make the most of your limited or large pantry area. Do you have a vacant wall for hanging? Will extra racks or baskets fit in your cabinets? What are your frequently used items that need to be in containers? There are plenty of organisers to choose from and doing an initial assessment of your space will surely make decision-making easier. Here are some of the best pantry organisation essentials that can motivate you to start working on that dream pantry. Nuts, flour, sugar, and dried fruits are some of the frequently used food items that are perfect in glass jars. Clip-top jars in varying sizes will keep your food fresh with an airtight seal, while those with wide openings are ideal for staples that need to be scooped out. Clear glass also lets you know at a glance when you need to purge or restock. Using non-absorbent, stain-resistant jars is also ideal for keeping wet goods like honey or oil. They work well in cold storage, too. If you have several open shelves in your pantry, clear and sturdy plastic containers are ideal as they are lighter in weight than glass. Canisters with an airtight seal feature are also highly recommended to keep your dry goods fresh longer. The best part is, you can pop them in the dishwasher for a quick cleanup. Use the long, rectangular canisters for storing your dried spaghetti noodles, lasagne sheets, and cereals. Cookies, candy, crackers, and beans on the other hand are perfect for short, square-shaped ones. The freshness and aroma of coffee beans, ground coffee, and spices can be significantly affected when exposed to light and air. For these ingredients, ceramic or metal canisters are ideal. Containers made of stoneware usually come in beautiful colours and designs that can help you create a bright or rustic pantry. Contemporary kitchens make a perfect match with tin or stainless steel containers. Aside from their lighter and more durable material, metal canisters are stain and odour-resistant. If you have food in boxes or small bottles, putting them in one container will make them easier to locate. You can even arrange similar items together so you can take them out in one go. For example, you can create labelled bins for baking, lunch box prep, breakfast, or pasta. Packed food items that may spill should be in plastic bins that are easier to wipe or clean. Wire baskets are great for storing fresh produce, while woven ones work for food in boxes or bags. Stocking up your pantry shelves is fantastic, but having to reach for that canned soup at the back of your shelf isn’t. Placing lazy susans or turntables in your pantry will solve this problem. Fill them with canned food, bread spreads, or condiments so you can easily get them with one simple spin. They are great for storing bottles that you can’t stack, too. Getting a durable, easy-to-clean plastic turntable is best as it works anywhere, be it on your cabinet shelves, bench, or fridge. When your bakeware collection, serving boards, and pot lids are cluttering up your pantry, then a bakeware or lid organiser is just perfect. This will let you arrange your baking tins and trays in a file so you can get them when needed without scratching their surfaces. Ideally, choose an organiser that can expand and retract or have adjustable divider slots so you can easily customise it to fit your needs. Small bottles or shakers can easily get lost in a sea of taller bottles and large cans. Remedy this by storing them in one bin or by installing metal racks on your bare pantry wall. The inside of your sturdy cabinet doors will also work well. Use these racks for storing your herb containers, salt shakers, and pepper mills so you can effortlessly spice up a new dish. 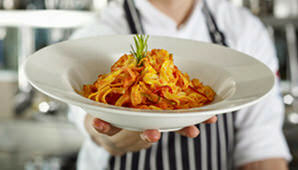 These will even put your versatility as a home cook on display! Don’t let your extra chips or leftover biscuits go to waste! Have a stash of reusable or resealable bags on hand so you can keep them fresh until someone starts hunting for a snack. You can even use these bags for portioning your pack of cookies then grab them before leaving for school or work. You’ll be helping reduce plastic and paper wastes, too. Arranging your spoons, forks, and knives in a cutlery tray not only makes them easier to find, but also keeps them in good condition. Use a tray that has the right number of compartments, depending on the types and amount of cutlery you have. Cooking utensils on the other hand can be stored in stoneware jars. This will let you store both your long wooden spoon or shorter whisks in one container and even free up some drawer space. Finally, don’t forget about your sink area. Putting your soap, sponge, and brush in a pretty container can make even cleanup enticing! Use a caddy made of durable plastic and has functional compartments. Make sure to drain it regularly to prevent excess water from building up.